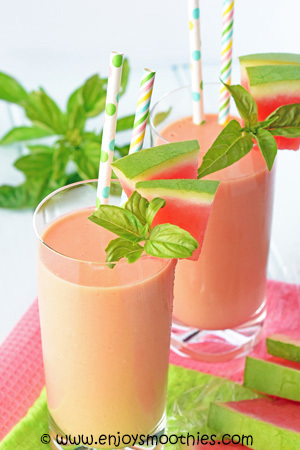 Nothing says summer more than a watermelon smoothie. Apart from simply eating it, there’s no better way to enjoy the fruit. Its pink juicy flesh and sweet flavor makes it one of my all-time favourite fruits. I always have some on hand during summer. 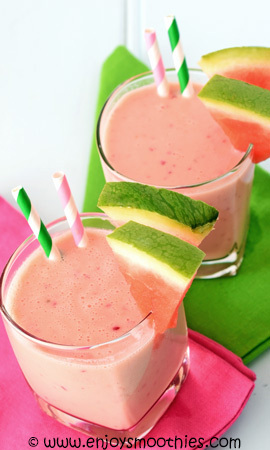 Watermelon has a high water content which is why I love to eat it on a hot summer day, it’s so refreshing and hydrating. But this also means using less liquid in your smoothie. Start by blending all your ingredients together, minus any liquid. Whether you need to add any liquid will depend on your other ingredients. 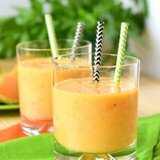 In fact, your smoothie may need a thickening agent. I love to add chia gel, frozen bananas or yogurt. You might be surprised to learn that watermelon can be mixed with so many other fruits. Berries, of course, top the list, followed by other fruits such as pineapple and orange. Then there's the creamier fruits such as bananas and mango. 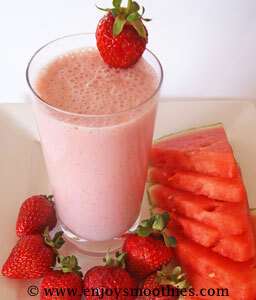 When using watermelon for smoothies, a 1 ½ inch (4 cm) slice will give you approximately 1 cup of chopped fruit. If you are buying a whole, uncut watermelon look for fruit that feels heavy for its size. This is an indication of ripeness. A fully ripened watermelon is more than 90% water, and water is one of the heaviest components in food. The rind should be smooth without any cuts or bruises and slightly dulled on top. Watermelon can also be purchased pre-cut into quarters or halves. Choose fruit with brightly colored flesh minus any white streaks. The flesh should also be firm with no soft spots. Whole watermelon can be stored in a cool, dark place. Cut sections however should be stored in the refrigerator for two or three days. More than just water and sugar, watermelon is a nutrient dense food that is low in calories. It is also an excellent source of Vitamin A, and a good source of potassium, vitamin B6 and Vitamin C.
But it is most famous for its antioxidant properties. Watermelon is high in lycopene, a powerful carotenoid antioxidant that gives food such as tomatoes and grapefruit their pink/red color. The levels of lycopene in watermelon are higher than any other fruit or vegetable and one and a half times more than tomatoes. Place the watermelon, mango, almond milk, vanilla yogurt and grated ginger in your blender and process until a smooth consistency. 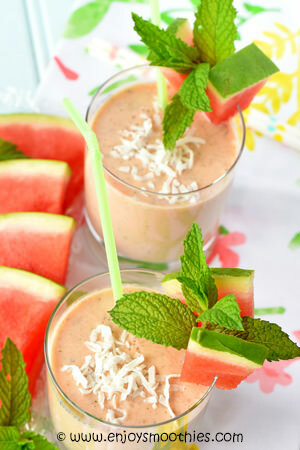 Combine the watermelon, pineapple, coconut yogurt, mint leaves, chia gel, ground cinnamon and honey and blend until smooth. Make your chia gel by soaking 1 tablespoon white chia seeds in 1/3 cup coconut milk for about 10 – 15 minutes. Cut a generous slice of watermelon for this recipe. Then cut the peach in half and remove the stone. 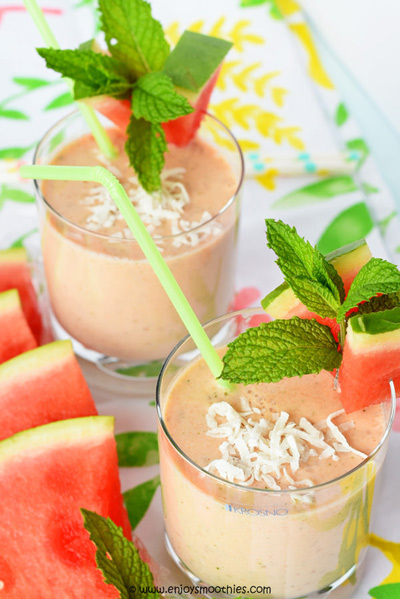 Mix together the watermelon, peach, coconut water, yogurt and lime juice. 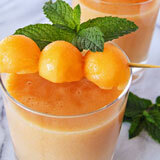 Pour into two glasses and enjoy this wonderfully refreshing drink. 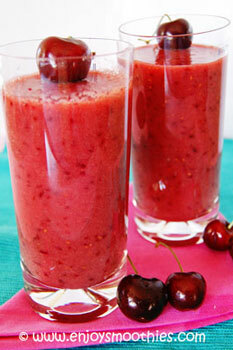 In a blender combine chopped watermelon, cherries, raspberries and cranberry juice. Secure lid and start blending on low. 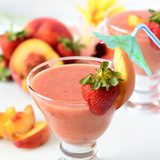 When fruit is chopped increase to high and blend until smooth and creamy. 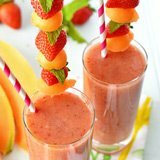 Place the watermelon, strawberries, frozen yogurt and milk in a blender and process for a minute or until smooth and creamy.